I’m a chai latte junkie. This has its downsides here in Denmark where they cost $8-$9 a pop and most places don’t have soymilk. So, I’ve taken matters into my own hands (again) and now I make them myself at home, with soymilk, and for way less than $8. Of course, this doesn’t replace meeting friends at a café on a Saturday afternoon, but it sure is nice to sip one at home when I don’t feel like going out. I use English Breakfast tea for this. It’s a readily available black tea that’s generally fixed with milk and sugar, so it works well. 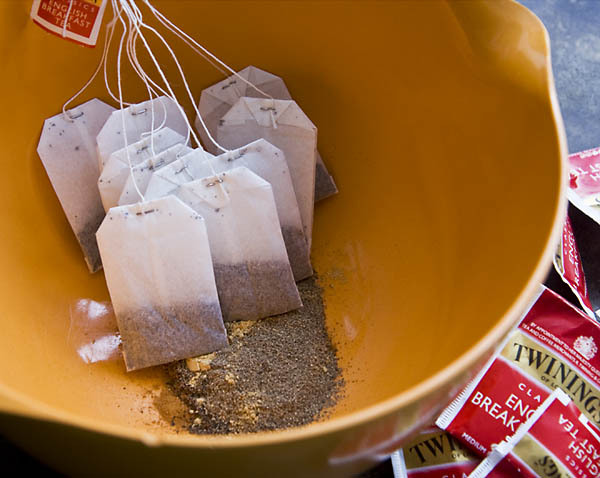 I add the spices and teabags to a large bowl, add the boiling water, stir, and steep it for 20 minutes or so. Then, I remove the teabags and strain it through my yogurt cheese maker a couple of times to filter out the sediment from the spices. Using whole cardamom, nutmeg, cloves, etc., would simplify things, but I have an easier time finding ground spices here, so that’s what I use. After it’s been well strained, I stir in the sugar, honey, and vanilla, and store it in the fridge in a Mason jar. When I want a chai latte, I mix the heated syrup about 50/50 with frothed soy milk. I used to have a really nice super automatic Jura Capresso, but my equipment is a bit more humble these days, so I just use the microwave and a frothing wand. Uhh – have been looking for some chai latte powder at the supermarkets here, but so far have failed (thinking that I just don’t know where to look). But maybe there is none? So maybe making it myself is the solution. Stumpled upon this by a coincidence. I don’t know of this is considered the right chai, but many cafes sell the mixture they use for their chai latte and specialist coffee and tea shops will sell them as well. Denmark has several small shops specializing in coffee and whiskey and stuff. they will often have things like chai and special chocolate as well. I live in Okinawa, Japan, where a tall chai at Starbucks is $5. Your version tastes great and I imagine is healthier, as well.